Question: Is it possible to have an open-­air, on­-farm poultry slaughter/processing facility and still be in compliance with 9 CFR 381.10 and all other applicable federal regulations? Answer (07/31/2015): Based on current policy, there is not a prescriptive requirement that a poultry exempt operator is prohibited from having some aspects of its slaughter done out of doors. Remember that guidelines (including the Sanitation Guide) are not to necessarily be interpreted as a prescriptive checklist for either an oﬃcial establishment or an exempt operation. Sanitation Performance Standards (SPS) language references facilities in the general terms of the brick‐and-mortar paradigm, and that for an oﬃcial establishment this would be applicable. The possible exception, in a limited sense, might be a federally‐inspected mobile slaughter unit, which might feature bleeding, scalding, etc., in an outdoor environ still subject to pest control and other operational sanitation. 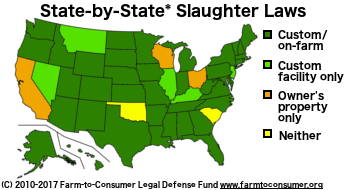 See: http://www.fsis.usda.gov/PDF/Compliance_Guide_Mobile_Slaughter.pdf. 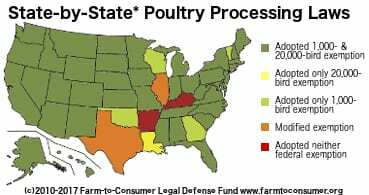 The Poultry Products Inspection Act, 21 U.S.C. § 464, states that the Secretary shall, by regulation and under such conditions, as to sanitary standards, practices, and procedures as he/she may prescribe, exempt from speciﬁc provisions of the Act, certain poultry producers. Consequently, the regulations for the poultry exemptions found in 9 CFR 381.10(a) state that exempt poultry shall be slaughtered and cut up and handled under such sanitary standards, practices and procedures as results in the preparation of poultry products that are not adulterated when so distributed. Therefore, there is not a speciﬁc FSIS regulation for exempt operators that prohibits open air or outdoor slaughter. Custom slaughter and processing, or other exempt operations, must be done in a sanitary manner and may be done in open air conditions. It will be the exempt operator’s responsibility to slaughter and process the poultry in accordance with the adulteration provisions found in the Act. For example, the poultry would be adulterated if it was prepared, packed or held under insanitary conditions whereby it may have become contaminated with ﬁlth, or whereby it may have been rendered injurious to health. The exempt operator would have to account for open air conditions that may lead to adulteration, e.g., access to product by vermin, such as ﬂies, mice or birds or from contamination from dirt, dust or debris. These conditions might be inﬂuenced by seasonal and geographic considerations, so the burden would still be on the operator to avoid operational sanitation issues such as visible evidence of ﬂying insect problems, not just the theoretical possibility of pest problems. 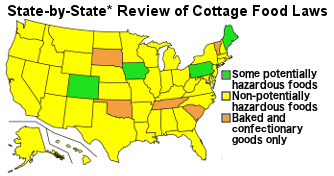 State or county regulations may exist which impose tighter controls, however.